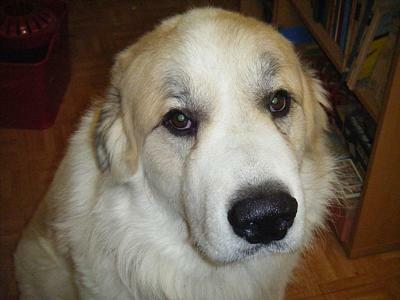 Oso is a 3 ½ year old male house Pyr whose humans must move into an apartment in the spring and cannot take him with them. They are very sad about it and hope very much that he finds someone who will love him as much as they do. Here is what the lady has told me. He is presently intact but he will be neutered and be up to date with his vaccinations before going to a new home. Since I do not have room to foster him immediately, Oso is living with his present humans in the hope that he can move directly to a new home before they have to move. 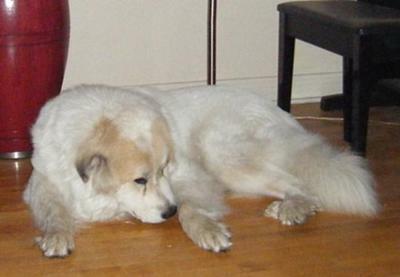 Oso has found his new forever home with two Great Pyr lovers. He is settling in very nicely in his new country home. We are sure his new owners will keep us informed of his progress. Oso est un male de 3½ ans qui vit dans la maison avec ses humains. Malheureusement ceux-ci doivent déménager dans un appartement au printemps et ils ne peuvent pas amener Oso. Ça les peine de devoir le laisser aller et ils espèrent que quelqu’un d’autre l ‘aimera autant qu’eux. Il est encore intact mais il sera châtré et à date avec ses vaccins avant de partir pour une nouvelle maison. Puisque je n’ai pas présentement de place pour le prendre ici, il reste avec sa famille et j’espère qu’il puisse partir pour sa nouvelle maison de chez eux, avant qu’ils doivent déménager qu’ils doivent déménager. He developed muscular tumours in the back legs and they were moving into his spine. We felt that due to the severity of the pain he was starting to have that we would put him down. He was the love of our lives and we have struggled with the loss. We have adopted a rescue pup that was in distress. We see so much of Oso in little Samson and it has helped us heal. We will never forget our loving Oso but do believe that the best way you can honor the dog you lost is give that space in your heart and home to another. We miss him dearly. I am pleased to add that Oso now has another pyr friend! 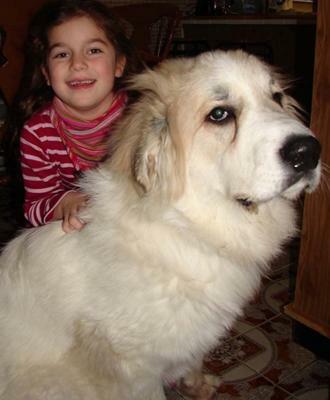 His new owners have 2 puppies (not pyrs) but fell in love with Glacier upon meeting him. Glacier and Oso had so much fun playing together, and since Glacier needed to be re-homed ... well, it is a very happy ending for two great pyrs. Congratulations and keep in touch! Sometimes Pyrs are just like candy... you can't have just one. I am so glad he was adopted. Love him... Great work everyone. I have moved into my new home and have 1 brother and 1 sister, they are mix breed pups and are very busy. So my new parents are enjoying my calm, quiet temperament. My mom is a groomer so I see a bath and a clean up in my near future. I live in the bush and am enjoying many walks in the country air. My new parents believe that the sun rises and sets on me so life is good. My mom and dad say Thank you very much to everyone who made it possible. Return to Post A Happy Tail 2010.